How Does Cayenne Pepper Boost Metabolism? Based in Malibu, Calif., Shannon Sukovaty has been writing health-related articles since 1992. Her work has appeared in “Colorado Health” magazine, “Health and Fitness Journal” magazine and on various websites. Sukovaty is a certified personal trainer with undergraduate studies in exercise physiology and credentials from the Aerobics and Fitness Association of America and the American College of Sports Medicine. Does Eating Celery Help You Lose Weight? Cayenne peppers add a kick of flavor to your food and can rev up your metabolism. The component in cayenne peppers that give it heat is capsaicin. Capsaicin raises your body's temperature and causes a boost in metabolism, according to "The New York Times." The cayenne pepper is also a beneficial pain reliever and is found in many topical ointments. 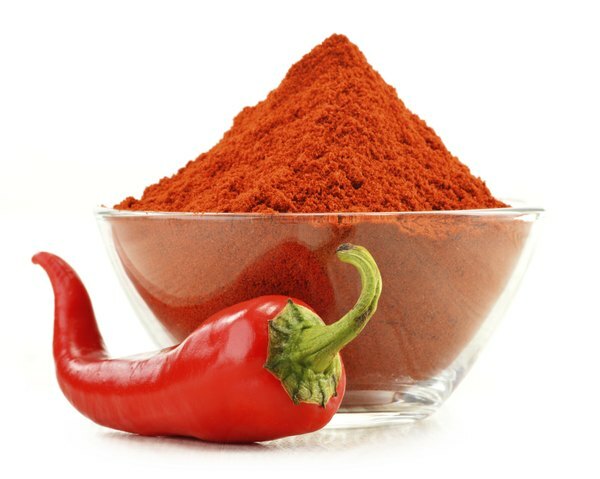 Capsaicin is the compound in cayenne peppers that gives it heat and boosts your metabolism. Capsaicin is found in the membranes of the cayenne inside the pepper. Capsaicin can also help aid in digestion, stimulate kidney function and help ease pain, according to Dr. Sanjay Gupta on CNN.com. The cayenne pepper has a moderate amount of capsaicin, placing it in the middle of the Scoville Heat Index. Your body converts the calories in whatever you eat and drink into energy -- this is called metabolism. When you eat spicy foods such as cayenne pepper, your body's heat production rises, which can cause a slight increase in your metabolic rate, notes the University of Maryland Medical Center. However, if you consume more calories than you burn daily, you will still gain weight, even if you are eating cayenne peppers. To lose weight with spicy foods, make sure you eat fewer calories than you burn daily along with adding a bit of cayenne to your meals and snacks. Cayenne peppers are simple to add to meals and snacks. Cayenne comes in raw, whole form or you can purchase cayenne pepper as a dried spice. Add fresh cayenne to your egg whites, salads, soups, marina sauce or stir fry for an extra punch. When using fresh cayenne, wash your hands thoroughly after cutting and handling -- the capsaicin can burn your eyes. Dried cayenne is simple and convenient to use. Sprinkle it on air-popped popcorn or raw almonds or add it to your main meal. Although the capsaicin in cayenne peppers have many health benefits, too much can be dangerous to your health, according to Dr. Gupta. Overeating peppers with high capsaicin content may cause diarrhea, skin rashes and other harmful side effects. A dash of cayenne on your meals and snacks is fine as long as it is in moderation. The New York Times: Really? Can You Lose Weight by Eating Oranges? Why Is Lemon in Water Good for You?